Honeybees take a beating. It used to be that anyone could easily keep bees with little work or maintenance. That is no longer true for anyone, even on the type of farm (chemical free, fields of flowers) we operate. Veroa mites, bee beetles and probably stuff we don't know about take out some hive members. Outside the hive there are all sorts of genetically modified crops growing, and those have been proven to have an awful effect on bees. Experienced bee keepers advise giving sugar water to bees. A mix called simple syrup in the kitchen, it offers bees food as they wind down and prepare for winter. This fall, with about 3 weeks of rain and then snow before bees slow down for winter means the bees were forced to eat their honey stores. Early. Too early to have honey to eat through the winter. We have a huge bag of honey and dispensers. 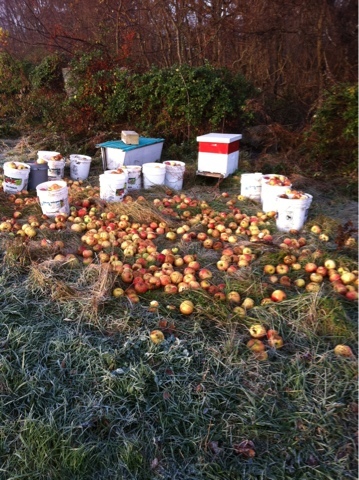 But for right now the bees are sucking up natures sugar, from the truckload of semirotting apples Homer picked up to feed the pigs. The bees love it and are out on them every day, the entire time the sun shines, feeding and carrying back to the hives.